How to prevent future loops using a control qubit? I am trying to construct a quantum multiplier using the method described here: https://arxiv.org/abs/quant-ph/0403048. However, it seems that the control qubit would only disable the following gates for one iteration. Afterward, the $|y\rangle$ would still be in the fundamental, so would flip $D$ again and enable the next iteration of gates. How do I prevent all future iterations (essentially break out of the loop) using a control qubit? You're correct, there is a bug in the algorithm described by the paper. 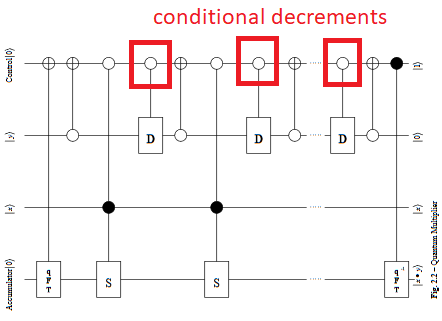 D should be unconditionally decremented in each iteration, and the control (which I would instead call the accumulator... except it looks like it is actually intended to control it?) should be toggled if D=0. The author has made the mistake of conditioning the decrement on the accumulator, which will prevent $D=0$ from becoming $D=2^N-1$ in the relevant iteration and result in the accumulator re-toggling in the next iteration. Not the answer you're looking for? Browse other questions tagged quantum-gate circuit-construction or ask your own question. What is the difference between quantum control and quantum optimal control? How do I add 1+1 using a quantum computer? How are two different registers being used as “control”? How do you implement the Toffoli gate using only single-qubit and CNOT gates? Is it possible to see how CompositeGates are decomposed when simulated using XmonSimulator?